With 2016’s American Pastoral, actor Ewan McGregor steps into the director’s chair for the first time. Based on Philip Roth’s Pulitzer Prize-winning 1997 novel, Pastoral takes place mainly in the 1960s. In his New Jersey community, Seymour "Swede" Levov (McGregor) seemed to live a charmed life. Handsome and popular, he married his beautiful high school sweetheart Dawn Dwyer (Jennifer Connelly) and appeared destined for continued success. Matters unravel in the midst of 1960s societal turmoil. Swede’s teen daughter Merry (Dakota Fanning) becomes involved in aspects of the revolutionary counter-culture, and she eventually goes missing after someone blows up the local post office. Pastoral comes framed by a high school reunion that features Swede’s younger brother Jerry (Rupert Evans) and classmate Nathan Zuckerman (David Straithairn). These moments appear early in the film and then vanish until the very end. Whenever these sequences appear, they lack purpose. The framing sections make sense in a novel but they fail to develop the story in a logical manner here, so they add nothing to the proceedings. Problems with the script and narrative don’t stop with the movie’s poor bookends, though, as much of the novel’s value gets lost in cinematic translation. Pastoral too often feels like a book that got adapted for the screen, but in clumsy fashion. Screenwriter John Romano doesn’t seem to understand that movies and novels work in different ways, so much of Pastoral appears to directly copy the source without attempts to refashion it for cinematic purposes. This means many “overly written” segments that flow awkwardly and lack a sense of realism. I also get the impression that Romano needed to lose massive parts of the original book, as Pastoral feels undernourished. It introduces and develops the main characters in a thin manner and never recovers from these missteps. The movie plods along without real direction, partly because it seems like it loses so much material. Without better fleshed-out characters, matters fail to do much to involve the viewer – we’re left at arm’s length and never invest in the participants. Pastoral speaks in “character shorthand” and requires us to accept people as we’re told they are, not as they seem. It builds backstory in a clumsy fashion and never provides much to bond us with the participants – especially Merry - and that becomes a fatal flaw. So much of the movie revolves around Swede’s pursuit of Merry that we really need more investment in the girl. We find little reason to care about her, though, as the film tosses out “development nuggets” that never connect us to her. When she goes missing, we don’t care, and we don’t invest enough feeling in Swede to worry about his well-being either. Pastoral seems miscast, especially in terms of McGregor as Swede. We’re essentially told that the young Swede was a god among men, a magnetic personality who excelled at sports and everything he did. And that’s not McGregor. No offense to the actor, as I think highly of him, but Swede appears to demand someone more like Robert Redford or Brad Pitt in their primes – traditionally attractive men with alpha male characteristics, not a moderately handsome guy who seems better suited to quirky character parts. Add to that McGregor’s less-than-convincing New Jersey accent and he flops as our lead. Poor Connelly and Fanning get little to do in their occasional scenes. Pastoral forces them into broad melodrama during their appearances, and both of them “act down” to the material. This means Connelly and Fanning deliver over-done, hammy performances beneath their talent levels. Maybe the actors realized they were stuck in a flawed movie and decided to overact to turn Pastoral into camp. As a director, McGregor neither helps nor harms Pastoral. For the most part, he seems to simply deliver the script as written, with few obvious flourishes or attempts at cinematic embellishment. I’m glad McGregor resists the temptation to overdirect the film, but I wish he would’ve tried harder to give the movie some personality. If he gets another shot, perhaps McGregor’s second directorial effort will likely work better. 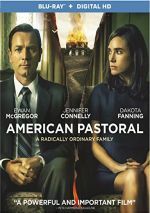 American Pastoral takes a successful novel and adapts it for the screen in a clunky, cliché manner that makes it a bore. American Pastoral appears in an aspect ratio of approximately 2.40:1 on this Blu-ray Disc. This turned into a terrific transfer. Sharpness appeared strong. Virtually no softness materialized in this tight, well-defined presentation. I noticed no issues with shimmering or jagged edges, and both edge haloes and source flaws remained absent. As one might expect from a period flick like this, Pastoral provided a stylized palette. Colors tended toward a golden/orange bent, with a little teal thrown in at times. The hues seemed satisfactory. Blacks showed good depth and darkness, while shadows were solid. Across the board, everything about the image stood out as excellent. Given the film’s character scope, the DTS-HD MA 5.1 soundtrack of Pastoral didn’t boast a great deal of dynamic material. Nonetheless, it had its moments. Some violent scenes used the spectrum well, and various outside elements – trains, rivers, etc. - opened up the environment in a satisfying way. There wasn’t much to stand out, but the track did what it needed to do. Audio quality was quite good. Speech was natural and concise, as the lines lacked noticeable concerns. Music was rich and warm as well. Effects didn’t have a ton to do, but they were full and clear; the occasional louder elements showed positive punch as well. While nothing here impressed a ton, the track still was good enough for a “B-“. Among the set’s extras, we find an audio commentary from actor/director Ewan McGregor. He delivers a running, screen-specific discussion of the source and its adaptation, story/characters, costumes, sets, locations and period details, music, cast and performances, visual design, and connected domains. Overall, McGregor presents a pretty good chat. He offers an engaging personality and avoids the usual “happy talk” pitfalls much of the time, though he does go quiet a little too often. Still, McGregor fleshes out his experiences in a largely satisfying manner. Two featurettes follow. 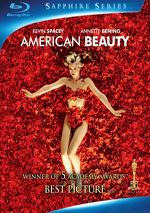 Adapting An American Classic runs 28 minutes, two seconds and provides remarks from McGregor, producers Gary Lucchesi and Tom Rosenberg, screenwriter John Romano, and actors Jennifer Connelly, Dakota Fanning, Uzo Adoba, Rupert Evans, Valorie Curry and David Strathairn. “Classic” looks at the source novel and its slow path to the screen, story, character and script issues, casting and performances, and McGregor’s impact as director. Inevitably, a moderate amount of happy talk emerges here, but “Classic” still manages to present a reasonable amount of good information. Making the American Dream goes for 17 minutes, 38 seconds and features McGregor, Connelly, Lucchesi, Rosenberg, Romano, Fanning, cinematographer Martin Ruhe, production designer Dan Clancy, and costume designer Lindsay McKay. This piece examines sets and locations, cinematography, costumes and visual design. “Dream” covers its topics in a concise and compelling manner. The disc opens with ads for Deepwater Horizon, Our Kind of Traitor, Hacksaw Ridge, and Indignation. No trailer for Pastoral appears here. A second disc presents a DVD copy of Pastoral. It includes the same extras as the Blu-ray. Ewan McGregor takes the reins as director for American Pastoral, but he does little to create a good movie. Saddled with an awkward script, the movie seems slippery and unconvincing in its attempts to create a family-based drama. The Blu-ray offers excellent picture along with generally good audio and a few informative bonus materials. Pastoral lacks much drive or emotional resonance, so it ends up as a flawed effort.